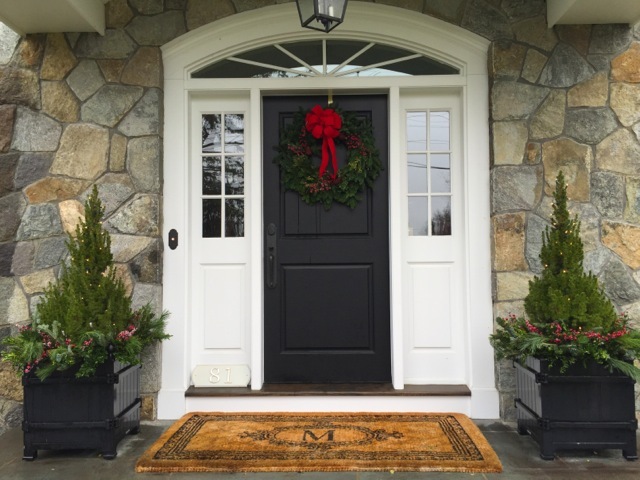 Earlier this week, I shared how my home is decorated (outside) for the holidays and I was thrilled to have a little more of my home shared yesterday on my friend Sue’s blog, The Zhush! 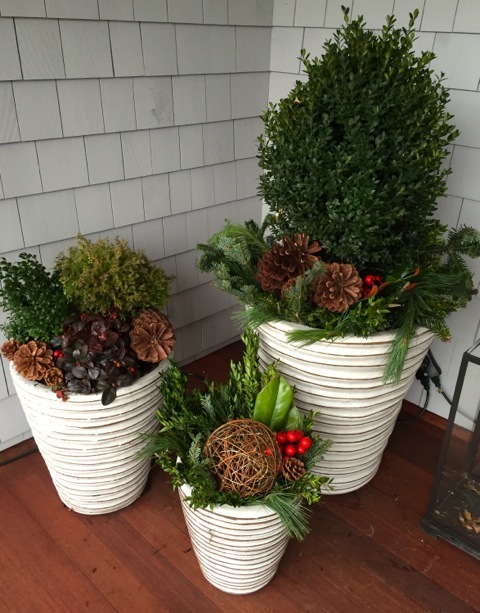 So, today I wanted to share some more ideas for decorating your outdoor pots from my friends Amy and Amy of The Outdoors Contained. They do pots for every season, but I especially love what they’ve done for winter. 4. 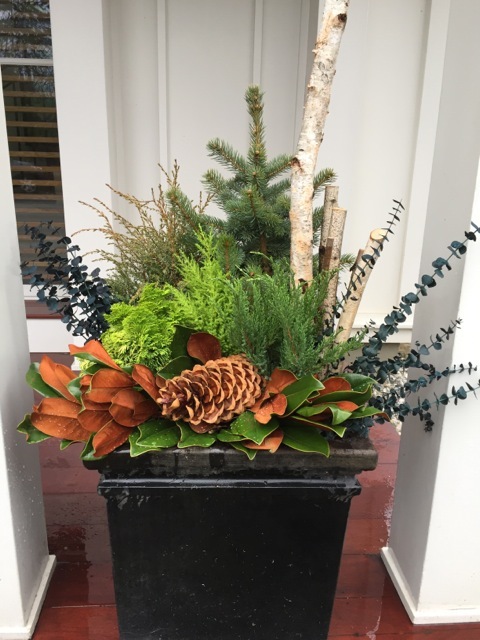 It helps to lay out the arrangement as you will pot it, while you are at the nursery. That way you can be sure you are happy with the arrangement and can make any changes that are necessary. 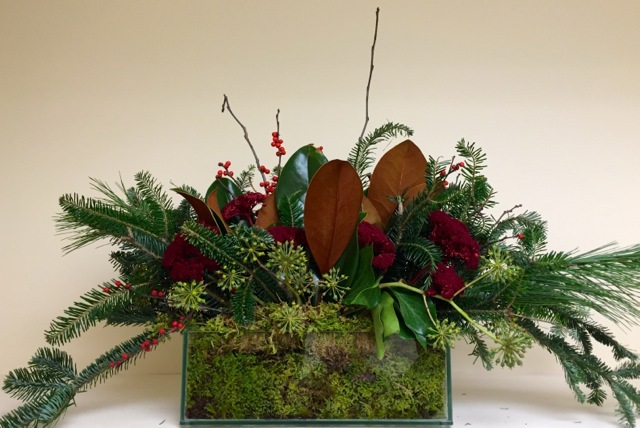 Aren’t you inspired to create your own beautiful arrangements? 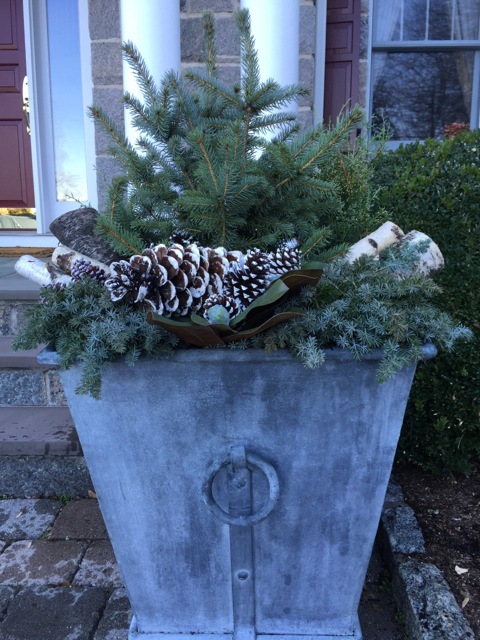 If you live locally and would like for “the Amys” to create something beautiful for your home, you can reach them at outdoorscontained@gmail.com. I think it might just be the best holiday gift you give yourself! Hello, Elizabeth! Oh my goodness, it’s been such a long time since I stopped by! Seeing your lovely house on Instagram yesterday made me wish I could just pop over for a class of champagne to see everything you’ve done to make it festive and lovely. The next best thing is visiting you in blogland. And, of course, everything looks beautiful! Even Molly is decked for the holidays! I hope the season is off to a lovely start for you and your family. Sending all kinds of hugs and cheer your way! XOXO & Ho ho ho!